Sarah Minor: The minutes are counting UP!!! This is the type of screen I have been seeing all day. I finally finished wading through 2 and a half hours of interview to get this done. 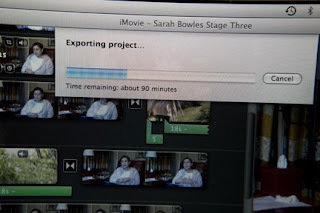 The new iMovie isn't as intuitive as it should be if you don't have Final Cut. So in reward to myself for getting this done I went back to the Hummingbird bakery on my own to get a few. Much to the envy of the roommates. I am just happy to have this done and move on. But it takes forever to export and I have 4 stages to do so I decided to slow it down even more to post this blog and get it out of the way today. bringing back my nightmares from the CMR!